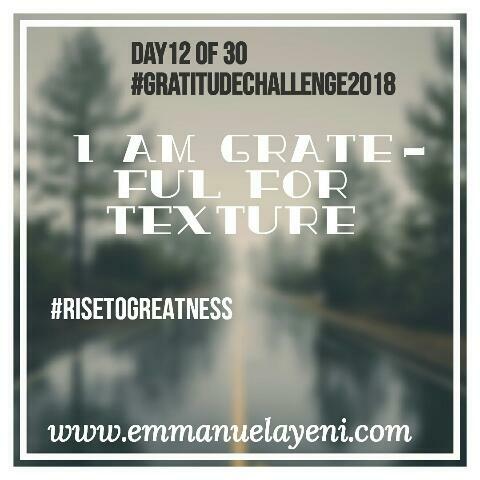 I am grateful for the different textures life offers us. There is always a smooth and a rough edge to every surface, these all form a major part of the surface on which we have chosen to move. Movement is never carried out without hitting the surface running except you are flying, even at that, air movement is done within the air surface medium and it is still a body within a medium of air. Texture and the appreciation of texture becomes real on the occasion of touch or contact, just like in the case of movement. Looking on to a deeper outlook of life, relationship with people and just as the matters of the heart has the smooth and rough sides of it. A good part of texture is that rather than it bringing about friction which opposes motion, if it is well applied it channelled will provide stability. On another plane, the texture of a unique work of art or beautiful painting helps us appreciate its quality and uniqueness. Today I have chosen to be thankful and grateful for texture across all surface or media.